Latvian hybrid airline airBaltic is well on its way to becoming an all-A220 operator – after taking delivery of its 14th Airbus A220-300 jet, while phasing out three Boeing 737CLs. The Canadian-built aircraft, with registration number YL-CSM, arrived at the airline’s hub at Riga International Airport on December 1, completing deliveries for 2018. Since the carrier launched its Airbus A220-300 (known as the Bombardier CSeries 300 back then) operations in December 2016, it has transported on them more than 1.85 million passengers, with every third airBaltic passenger now flying on the aircraft. The airline’s A220-300s, which have completed more than 17,684 flights and flown more than 47,475 block hours, complement airBaltic’s Boeing 737 and Bombardier Q400NG turboprops, which are to be gradually phased-out as more A220s are introduced to the fleet. 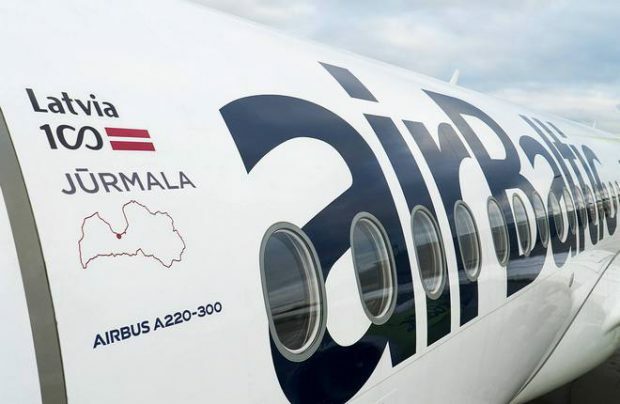 By the end of 2019, the Latvian flag carrier plans to operate a fleet of 22 Airbus A220-300 aircraft. Last May, airBaltic announced a firm, long-term purchase agreement for 30 of the aircraft, with options for an additional 30. The order complements its existing order of 20 A220-300s. Over the past 10 months, the airline has flown 3.55 million passengers, 18 per cent up year-on-year, and generated a total revenue of €180.8 million in the first half of this year, a 19 per cent increase over the same period in 2017. The carrier’s fleet currently consists of 34 aircraft: 14 Airbus A220-300s, eight Boeing 737 ‘Classics’ and 12 Bombardier Q400 NextGen turboprops.